Welcome to the Digital Farmington blog and map. This blog is administered by Dr. Katherine Hermes, a professor of U.S. History in the history department at Central Connecticut State University, and Andres Verzosa, executive director of the Stanley-Whitman House (SWH) in Farmington, CT. 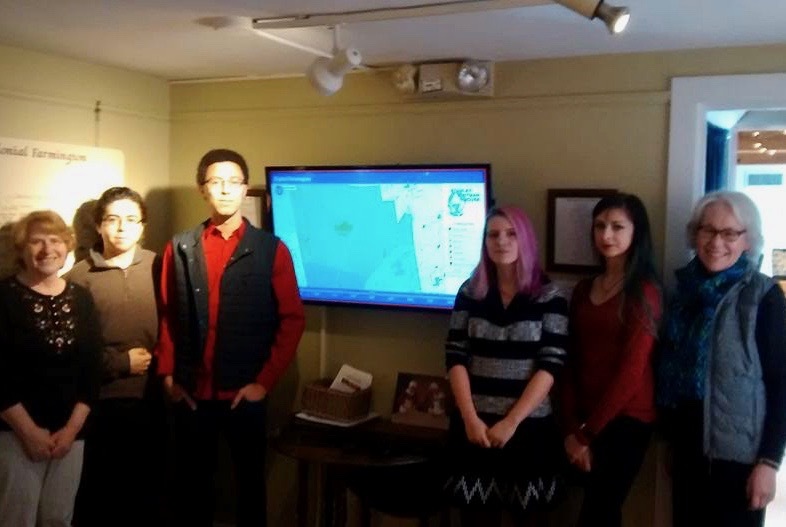 The blog is a partnership between several of Dr. Hermes’ classes and the SWH to show change over time in Farmington through the use of a digital map. The map is the top-notch creation of students from CS 410 Software Engineering taught by CCSU Professor Stan Kurkovsky. The original map was created in 2015 by Sweta Mishra, Trung Phung, and Chad Tower, who competed with two other groups for the winning design. The computer science team for the 2017 map, which is featured on our site now, consisted of Chelsea Edwards, Austin Miller, Arnika Obrusnik, and Adrian Ward-Manthey. Interns are continuously adding points of interest to the map. When the map was developed, Lisa Johnson was the executive director of SWH and was instrumental in choosing many of its features. The team, L-R: Dr. Katherine Hermes, Austin Miller, Adrian Ward-Manthey, Chelsea Edwards, Arnika Obrusnik, and director Lisa Johnson. If you have any questions or comments about the site, please feel free to contact us. All of the student research published on this site is the property of the individual student-authors who contributed the content. It may not be copied or reproduced without permission from the authors. It may be excerpted and cited in accordance with fair-use educational principles. Our blog does not collect information about you. If you leave a comment, the blogsite records your email address, but we do not use that for any other purpose and you will never receive emails from us. We will not sell email addresses. If you receive a reply to a comment, that may come via your email.